India was the global host of the World Environment Day celebrations this year. The theme of World Environment Day 2018 was Beat Plastic Pollution and the Ministry of Environment, Forest & Climate Change (MoEFCC) of the Government of India made every Indian and global citizen pledge that, “If you can’t reuse it, refuse it.” A global campaign was initiated to Beat Plastic Pollution and nations, companies and citizens came together to discard the use of plastics and shift to more sustainable and recyclable materials. The Delhi Greens Blog joined the Government is urging everyone to Beat Plastic Pollution even before Environment Day 2018. Now, however, the Government of India seems to have taken just the opposite stand. After spending its energy and financial resources for reducing plastic pollution, the MyGov.in website is inviting the citizens of India to share success stories on the positive role plastics has had in their lives. Not only this, the MyGov.in website of the Government of India is also offering prizes worth Rs. 32,000/- for citizens who submit the most interesting positive role of plastic in their lives! And that is not all. There is also a second competition that has been announced on the MyGov.in website with a total cash prize of Rs. 15,000/-. This one is a Slogan Writing Competition on “Bringing out the positive role of plastics and removing the negativity around use of plastics.” The description of this competition goes on to say that, “It is necessary to understand the positive role that plastics are playing and could continue to play in improving the quality of life of citizens” and “The negativity around the use of plastics needs to be effectively addressed.” One really has to read the details of this competition to actually believe that it is happening (screenshot above)! Plastic has become a part and parcel of our lives and since we were initially unaware of its large-scale harm to the environment, most notably to the marine ecosystem, we let it enter our lives unabated. While there are some materials in our lives that are now exclusively made of plastic, there is a need to reduce our dependency on plastic and shift to more environment-friendly materials. As is the case with the plastic, there is definitely a role played by morphine in our lives. When all else fails, the doctors can and do suggest morphine for the patients. But that does not mean that we can have slogan writing competitions on the positive role of morphine in our lives. Plastic, like morphine, has also become an addiction – a dependency that we need to fight and use only as a worst-case scenario. Competitions such as those mentioned above negate all the efforts that Governments, the United Nations, NGOs and citizens around the world have made so far to reduce our dependency on plastic. 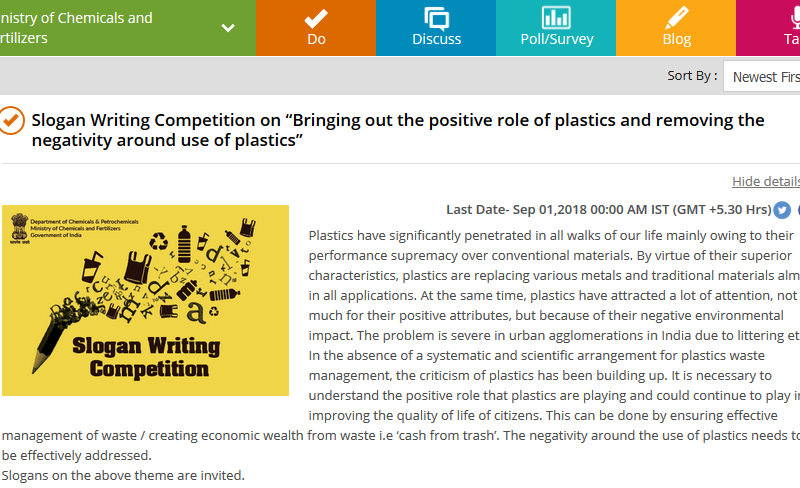 There have already been 600 entries made to these competitions on the MyGov.in website and many more people now think that it is okay to use plastic. It is unfortunate that the Government of India is conducting such competitions which only make the battle to Beat Plastic Pollution more difficult to win. There is also polythene in all government functions. Nothing unexpected.